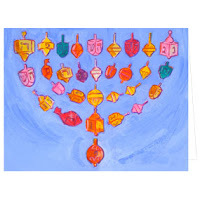 Podwal's whimsical Chanukah image of a menorah fashioned from dreidels was created especially for the Metroplitan Museum. Often focusing on Jewish legend, history, and tradition, artist and author Mark Podwal (American, b. 1945) is the illustrator of the new edition of the Reform Haggadah.